The Salandra Roma Suite Rome is an affordable guest house that offers cheap accommodation in the centre of Rome and is the ideal solution for those travelling on a budget. 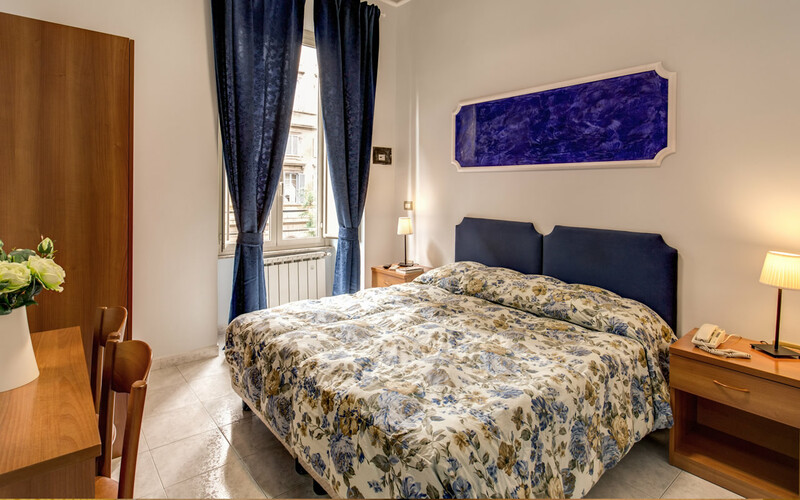 Located in the elegant area of Via Veneto, Salandra Roma Suite is within walking distance of the romantic Trevi Fountain and Spanish Steps, multiple galleries, museums, restaurants and shops as well as Rome’s underground metro network. The guest house itself offers soundproofed comfortable rooms equipped air conditioning and a private en-suite bathroom. The family running the guest house take the satisfaction of their guests very seriously and will treat you as a member of the family. Indeed, their slogan is "YOUR HOME IN ROME!". The Salandra Roma Suite Rome is located in a quiet and well connected area of Rome close to Piazza Repubblica (the closest underground metro station), Termini Station (the transport hub of Rome), the Trevi Fountain and Spanish Steps. The area surrounding our affordable guest house, has a wide variety of shops, restaurants, cafes and bars. There is also a supermarket just below the hotel, with a variety readymade vegetarian and vegan dishes that you can take away. 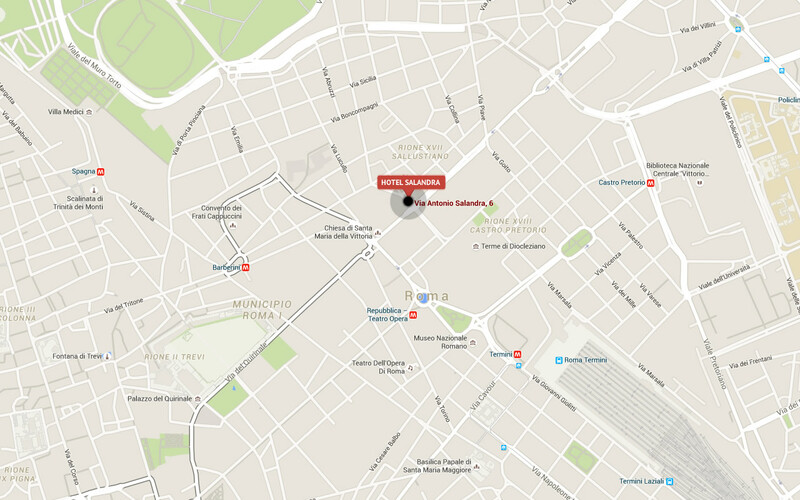 The proximity of the metro stations mean that you are also within easy reach of the main tourist attractions or other important transport hubs like Tiburtina Station. Read our Location page to learn more about how conveniently we are located. 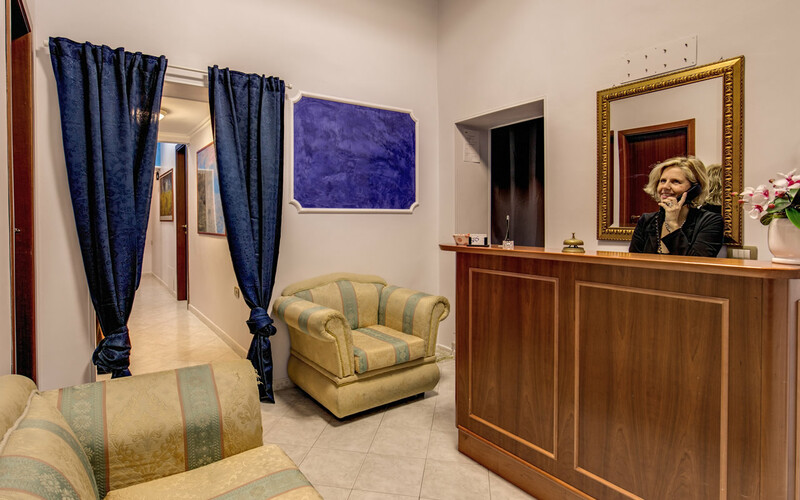 The Salandra Roma Suite guest house in Rome not only offers affordable comfortable accommodation, but our friendly multi lingual staff are also on hand to make your stay as pleasant as possible. To this end we offer a variety of hotel type services for your comfort including a complimentary breakfast served to your bedroom. We also operate a reception desk to answer your questions and solve any problems you may have. Take a look at our Rooms & Services page to learn more about our services and facilities.